Annie is such a pretty girl! She is a smartie, too, as Arabians usually are. Born in 1989, Annie is an older mare, but she is an easy keeper and is very healthy. She came to us from another shelter and we're happy to have her as she's fit easily into our horse community and is a lovely sight in her pasture. She has had no problem getting along with any of the other horses we've put her with and tends to be toward the bottom of the pecking order, which makes her a great candidate as a pasture pal for other horses. We've worked with her on basic ground handling skills and good catching patterns and she has made incredibly fast progress and is so sweet. 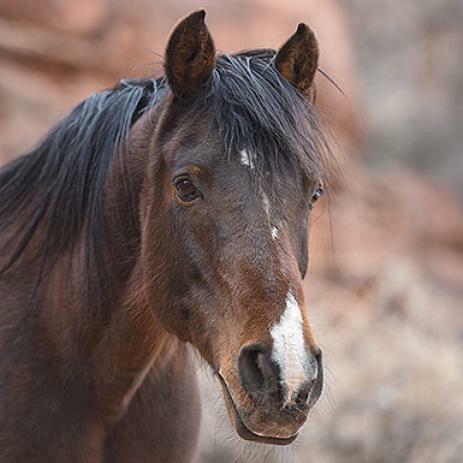 If you're looking for a kind and beautiful companion horse, you might be Annie's perfect forever home.